Retrieve the Dragon's Breath Mead and give it to either Olda or Horgeir. Speak to Olda in Dragon Bridge. Give the mead to Olda or Horgeir. Olda lives in Dragon Bridge with her husband, Horgeir, who owns the local lumber mill. You will find Olda at Horgeir's House. If you talk to her about her husband, she will complain to you: "He promised me, swore on his ancestors, that he'd give up the mead. And what do I find out? He's been stashing drink in a cave nearby. He even has some wolves guarding it. I swear, I should just cut out his tongue. That would be the end of it." 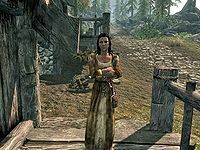 If you are willing to help get her husband's stash for her, she will only ask you to bring her the bottle of Dragon's Breath Mead, Horgeir's favorite. Take the road down the hill. Before the bridge go right, past the mill, and across the river. Head west on a rough trail and you will encounter some wolves, and possibly a bear, along the way. At the end of the trail, you will find an overhanging rock guarded by three wolves. 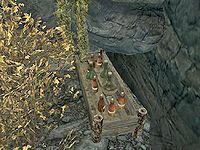 Beneath the rock is a crate holding the Dragon's Breath Mead along with one bottle of alto wine, six bottles of Nord mead and two bottles of wine. You are free to take every beverage there. Return to Olda and give her the mead. She will reward you with some gold, saying: "If my Horgeir doesn't give up the mead this time, I'll hit him over the head with it." You may instead choose to tell everything to Horgeir and return his favorite mead to him. He will regard you as a real friend and show you "how to block a punch that might be coming from some angry spouse". You will gain a one-point boost to your Block skill. However, if you choose to help Horgeir, you will fail this quest. Although it says "steal", picking up the mead does not count as stealing. An iron ore vein is to the north of some ruins along the path. If you can't get Olda to initiate the quest, merely taking Horgeir's hooch from its hiding place will do so. Although rest of the booze is there already, Horgeir's Dragon's Breath Mead will only spawn in the hiding location when the quest is initated. The Dragon Breath Mead may fall through and go underneath the ground. A possible fix involves using a ranged magic spell or a rune spell, such as Ice Spike, Thunderbolt, or Fire Rune to dislodge the bottle so that it can be picked up. The following empty quest stages were omitted from the table: 20, 25, 300. On the PC, it is possible to use the console to advance through the quest by entering setstage FreeformDragonBridge01 stage, where stage is the number of the stage you wish to complete. It is not possible to un-complete (i.e. go back) quest stages, but it is possible to clear all stages of the quest using resetquest FreeformDragonBridge01. This page was last modified on 13 March 2018, at 00:26.